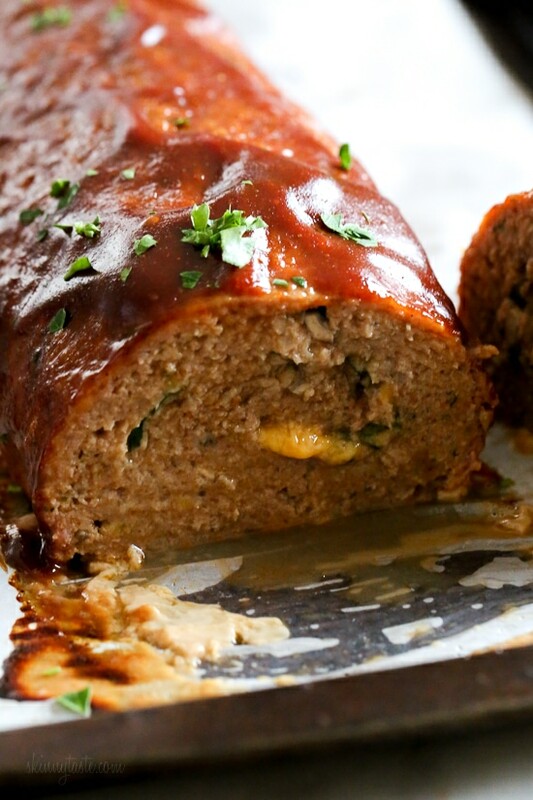 The best tasting, moist turkey meatloaf recipe stuffed with cheddar cheese, spinach and rolled, jelly roll style topped with a ketchup based glaze. 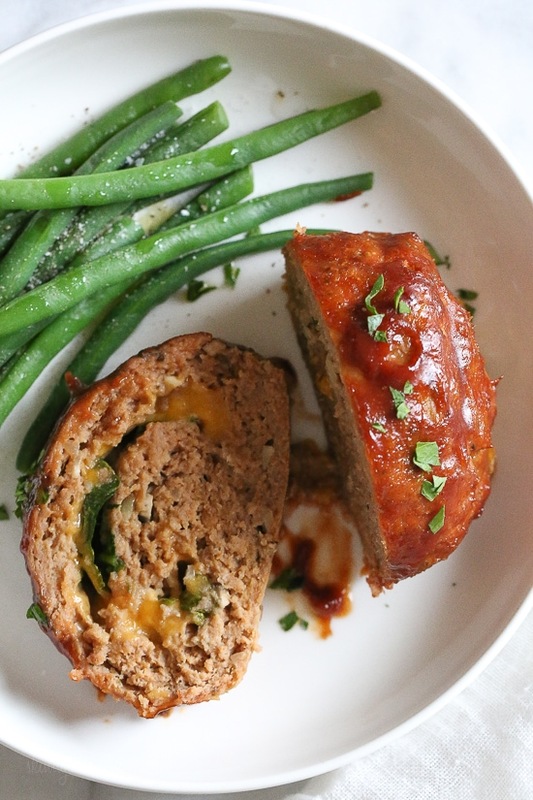 We love turkey meatloaf for dinner, it’s total comfort food. 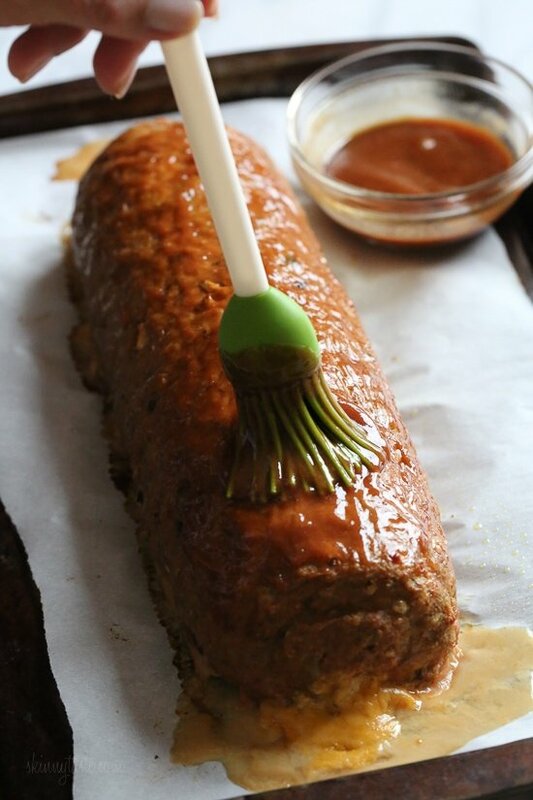 Using turkey in place of beef in your meatloaf lightens it up and it’s delicious! 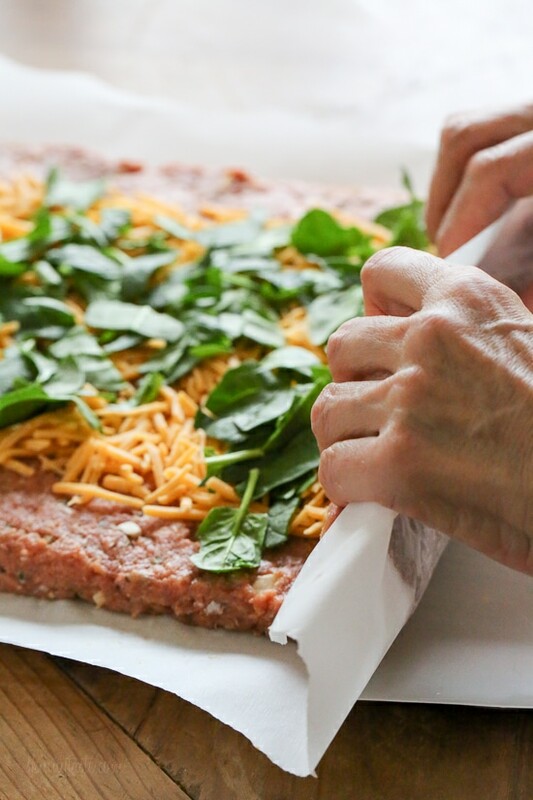 Stuffing it with cheese and spinach – total game changer!! I’ve had meatloaf on my mind all week and when I have food on my mind, I make it! I love sneaking some extra veggies in my meatloaf, no one minds and in my opinion in only enhances the meatloaf. I added mushrooms and spinach inside the meatloaf which means, pick kids can’t pick it out! I served this with veggies on the side, steamed green beans, corn or broccoli would be great. 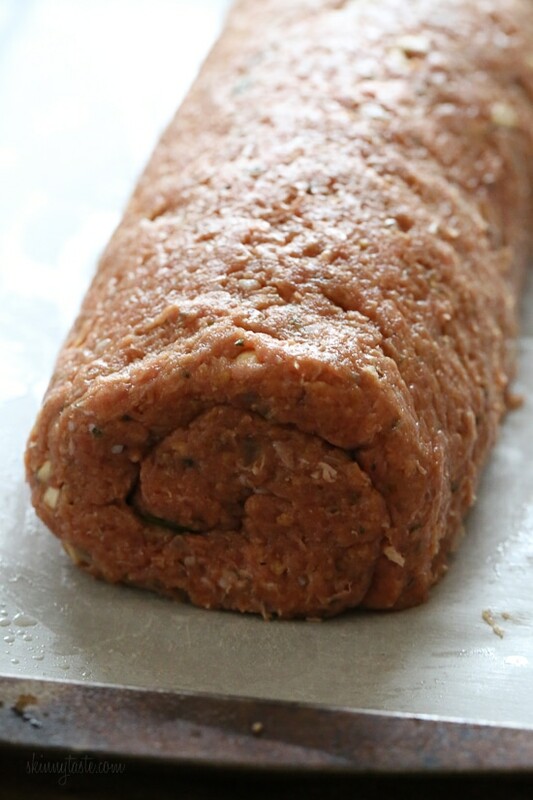 To make this meatloaf jelly roll style, I think the photos will help as a visual guide. You’ll use a piece of parchment to help you roll it, just take your time rolling, I have faith you can do it! 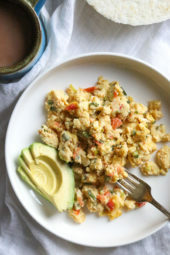 And if you make this, share your photos on Instagram or Facebook (are you part of the Skinnytaste Facebook Community? If not, you should be!) I am loving everyone’s bagel photos these past few weeks! You can swap the cheddar for mozzarella and swap the ketchup glaze for marinara for an Italian flair. Instead of the ketchup glaze, you can use BBQ sauce to give it a smokey flavor. If you think rolling will be a challenge, you can just mix everything together and form 2 loaves. Gluten-free oats can be used in place of breadcrumbs to make this gluten-free. I prefer the taste of 93% lean turkey over 99% which is much drier. You can of course use it if you desire. This makes enough for leftovers, you can reheat this the next day or make sandwiches. Refrigerate 3 to 4 days. The best tasting, moist turkey meatloaf stuffed with cheddar cheese, spinach and rolled, jelly roll style topped with a ketchup based glaze. In a large bowl combine ground turkey, mushrooms, shallot, breadcrumbs, ketchup, egg, salt and marjoram. Mix with your hands until well blended. Place on a 12- x 16-inch piece of parchment paper and pat firmly into a 10- x 12-inch rectangle. Sprinkle cheese mixture evenly over ground turkey followed by the spinach. Roll up jelly roll-style, starting from the short end, by lifting wax paper and removing the paper as you roll. Seal ends well. Place seam-side down in prepared baking dish. Bake 45 minutes. Remove from oven, brush the sauce over roll, and return to oven 10 to 15 minutes, or until no pink remains. 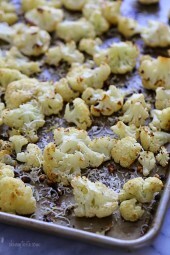 Remove from oven and allow to stand 10 minutes. Slice into 16 slices and serve. This was absolutely delicious. My husband didn’t even use ketchup! Absolutely delicious. The best meatloaf recipe I’ve ever made. Thanks Gina! This is a great meal on the grill too! Is this really “diet?” So delicious! Wow, was this yummy! I made a few substitutions based on what I had on hand– I used BBQ seasoning instead of marjoram, baby Bella mushrooms instead of cremini, and baby kale instead of spinach. As recommended, I used the 93% lean turkey and the meatloaf turned out so moist– definitely the most moist all-turkey meatloaf I have ever made. 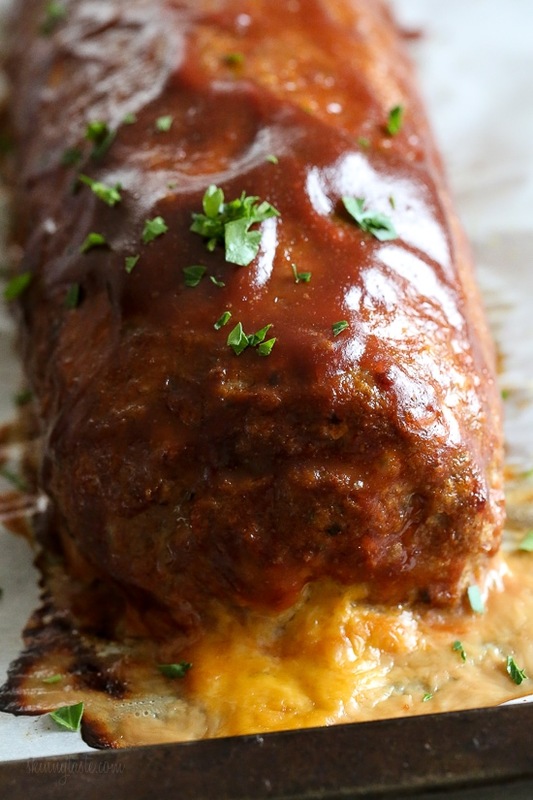 I’ve tried a lot of meatloaf recipes and this is one of the best so it’s definitely going into my regular rotation! BTW the rolling was not as tricky as I thought it would be (I dont bake so I had never made a jellyroll before). The only slightly tricky part was getting the rolled loaf into the pan. I tried picking it up but that would have made it break apart so finally I realized it was best to slide/roll it off the parchment paper into the cooking dish and that worked. Seriously delish. Leftovers are even good cold, right from the fridge. So moist and tasty. Easy to boot. Thank you! Am wondering if you could recommend a substitution for the mushrooms? Thanks! I just left the mushrooms out as nobody in our family likes them. It was delicious! Mushrooms are a terrific filler. We don’t care for them either, but I cut them up small and we could not tell they were in there at all! I’m planning on making a double batch. The first batch is for dinner but the other batch I wanted to freeze for later. What are your suggestions for this recipe? (freeze raw or cooked; thaw then reheat or reheat from frozen; oven temperature) Thanks! This was a big risk at our house, I don’t usually like meatloaf and my husband swears he can always taste the mustard and mushrooms in things. HOWEVER, the gamble paid off. He got the meatloaf he always wants and I snuck in some mustard and mushrooms. Added bonus, our toddler loved it too! We are adding this to the rotation. Yum! I halved the recipe, used real cheese and added parmesan and fresh minced garlic to the mix. I doubled the mushrooms and sauteed them with the shallots. I also used coarse ground Dijon from Trader Joe’s for the sauce. I only got one roll out of this. It was fantastic! My 6 year old had seconds and finished it. My 6 year old barely eats so that is a HUGE compliment! 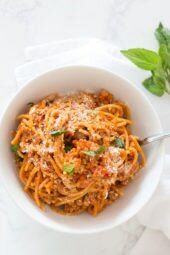 For 3 months now my partner and I have been making skinny taste recipies. We pick out recipies for each night of the week and go grocerie shopping on the weekend. We take leftovers for lunch. I have lost some weight but my partner has lost just over 20lbs!!!! Tonight we are having one of our favorites the cheesy stuffed turkey meatloaf along with green beans and a salad… We rarely eat out anymore like we were. Our grocery basket has changed from junk to proteins, veggies and fruit. Love, love, love this recipe. 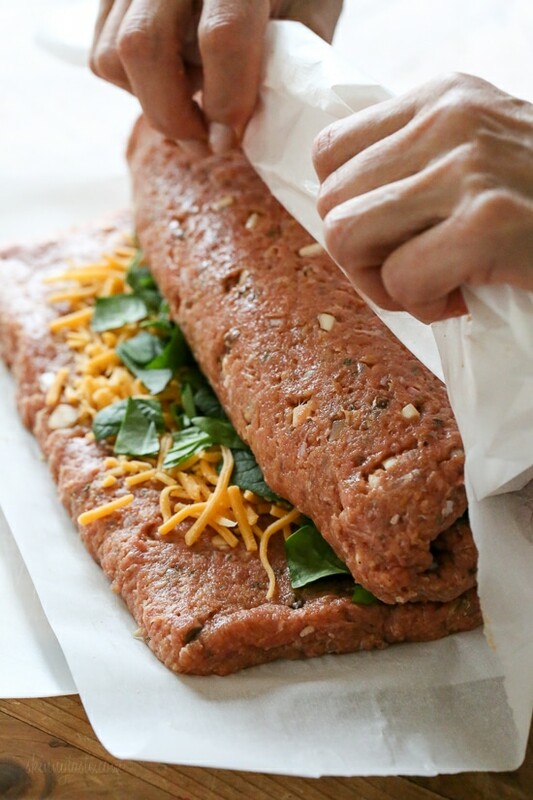 My children who are not big meatloaf eaters love this meatloaf. My husband says it’s the best meatloaf recipe he’s ever eaten. This was absolutely delicious! My 2 and 4 year old picky eaters ate it, which is huge, and my husband loved it. I honestly can’t stop thinking about having it for leftovers tonight! I’ve made this recipe about 10 times now and my fiancé, who hates my healthy recipes (especially with turkey! ), loves and asks for this now. I’m curious if anybody has tried freezing it before versus after baking and which works better. Wow! My husband and I are kinda “meh” about ground turkey, but we’re trying. 😉 I had initially planned to make the stroganoff meatball recipe for dinner but saw this in my Facebook feed. I showed my husband a picture, offering him the choice between the two options, and he chose this. This meatloaf was spectacular. Absolutely exceeded my expectations. Only conscious change I made was using oregano instead of marjoram because it’s what I had on hand. I probably overcooked the loaf while I prepared other side dishes but you wouldn’t know it. Super forgiving and juicy thanks to the mushrooms! Yes, we made this tonight and was a definite miss for us. Disappointing. This meatloaf is delicious! 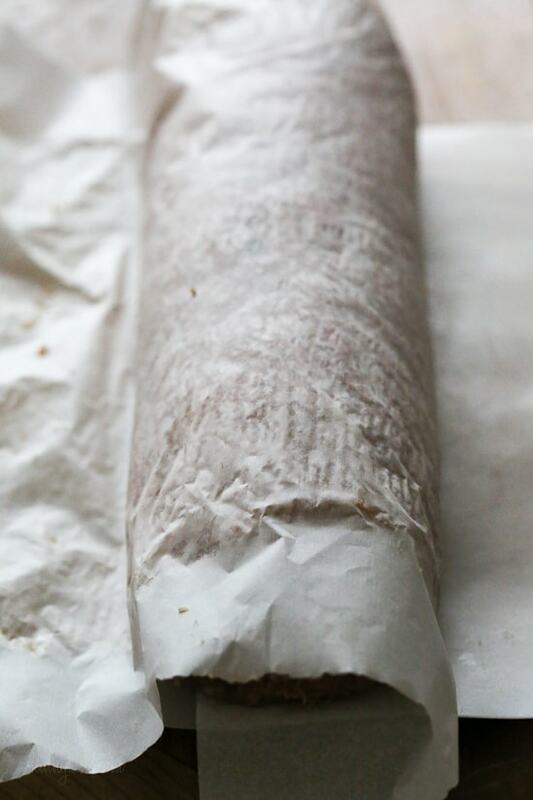 I’ve made it both rolled and just all mixed together – both equally just as good. And I’ve tried with and without the glaze – good both ways! Very easy recipe with enough for leftovers – win win! Thanks Gina! This was delicious! I mixed all the ingredients together instead of roll-style to make it quicker. I also used mozzarella instead of cheddar. It was super moist, husband and 5-year old kid approved. Thanks! Will leaving the mushrooms out change the consistency? I want to try this but can’t do mushrooms. any recommended substitutions to keep the volume/moisture the same, or just leave them out? Fantastic!!!! I made the Italian version with mozzarella and marinara. I used 90% lean turkey, but will use 93% next time, because the roll lost its shape a bit. I might try making it in a pyrex dish next time, and do a top and bottom layer, with the cheese and spinach in the middle. My husband who dislikes meatloaf (I love it) and claims to hate ground turkey had seconds of this last night and is still talking about how good it was this morning! Thank you Gina! We love this meal! 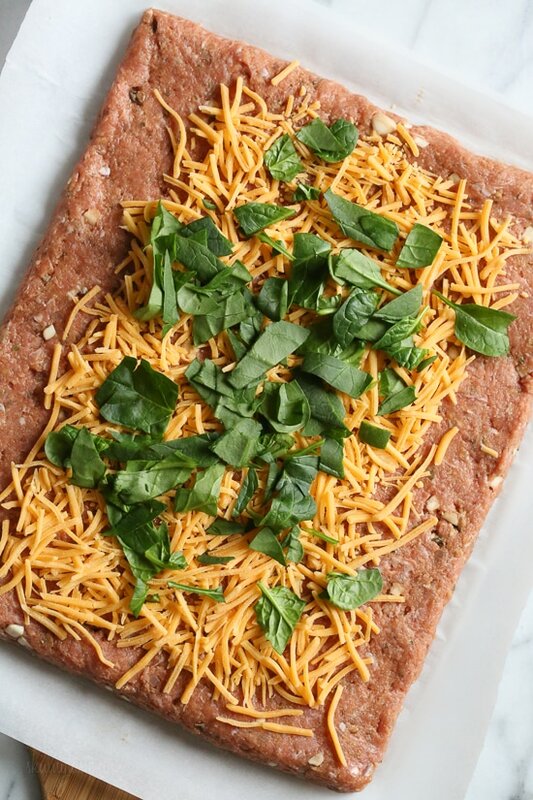 I sub out the cheddar and spinach for basil and mozzarella and we top with marinara sauce. One my 8 year olds favorite dinners!!! This was absolutely fantastic. My two boys (ages 13 and 11) were hesitant because of how it looked* but came back for seconds. This is a keeper and my kids made me print it to keep in our recipe lineup. Thanks for an awesome recipe! *After rolling loaf into a perfect cylinder, I was unsuccessful getting said loaf to the pan. So it became a tray of meat. I just pushed it down flat, tidied edges and baked as directed. Could you make the meatloaf mixture the night before and pop in the over next day? Or is it best to make everything same day start to finish? I’ve prepared this a day in advance and left it in the fridge for my husband to cook the next night. It held up fine. Looks delicious! 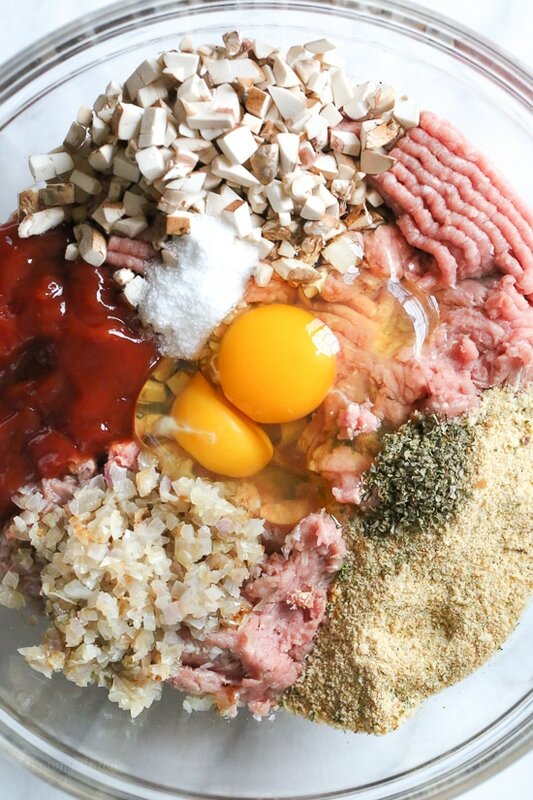 Do you think the meatloaf mixture could be used to make meatballs instead? I don’t see why not. Let me know if you try it! This recipe is a winner! To be honest, I’ll probably skip the cheese next time, just for ease. The meatloaf itself is so incredibly moist and flavorful that you don’t really need it. SERIOUSLY delicious. My 2 and 4 year olds tore it up. My husband and I both said I have to make this again! I never leave reviews on recipes but I have to say — this is awesomesauce! I made it last night for hubby and two of my kids and they all devoured it! Thankfully I was able to put some away for leftovers for lunch today. And it fits in to my daily SP, so win/win! This was “surprisingly excellent” from my husband-haha! 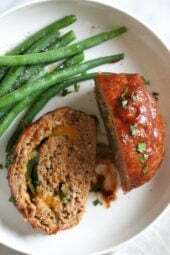 I have tried many turkey meatloaf recipes and there is only one other one that he says is as good as this recipe! Lots of flavour and very moist-I did double the Marjoram and used 2 teaspoons seasoning salt instead of kosher. I will definitely make this again-scrumptious! This meatloaf was outstanding. I couldn’t believe it was turkey!!! So darn delicious! Husband in LOVE! Going to make as meatballs for a few Holiday parties also. Did anyone use ground beef instead of turkey? My bf won’t eat turkey and am wondering if beef works just as well. I’ve made it with turkey before and it was amazing! Thanks! I made this last night and it was a huge hit with my entire family! This is the first comment I have EVER made on a recipe! Thanks Carrie! Glad everyone enjoyed it! Absolutely delicious! Thank you for the great recipe!